San Juan is the capital and most populous city in Puerto Rico. Founded in 1521 by Juan Ponce de León, who named it City of Puerto Rico (Rich Port). The capital of Puerto Rico is the oldest city under U.S. jurisdiction, but some people argue than St. Augustine, Florida, founded in 1565 is the oldest city in the continental United States. The history of San Juan begins a long time before its official foundation, in 1493, during his second voyage, Christopher Columbus landed in Puerto Rico. He named the island "San Juan Bautista", in honor of John the Baptist. But was not until 1508, that the Spanish government appointed Juan Ponce de León as the first governor of the island. He founded the original settlement in Caparra, now known as Pueblo Viejo, behind the almost land-locked harbor just to the west of the present metropolitan area and the city quickly became Spain's most important military outpost in the Caribbean. A year later, the original settlement was relocated to a nearby coastal islet (to the site of what is now called Old San Juan) and named Puerto Rico (Rich Port). Sometime during the 1520s, confusion over the names led to a switch, the island took the name of Puerto Rico and the town became San Juan. San Juan is located in the Northern Coastal Plains region in the karst zone, north of Aguas Buenas and Caguas; east of Bayamón; and west of Carolina and Trujillo Alto. The metropolitan area known as San Juan has 3 distinct areas: Old San Juan, the Beach & Resort area, and other outlying communities, the most important: Río Piedras, Hato Rey, Puerta de Tierra, and Santurce. Río Piedras was founded in 1714 but became incorporated into San Juan in 1951. 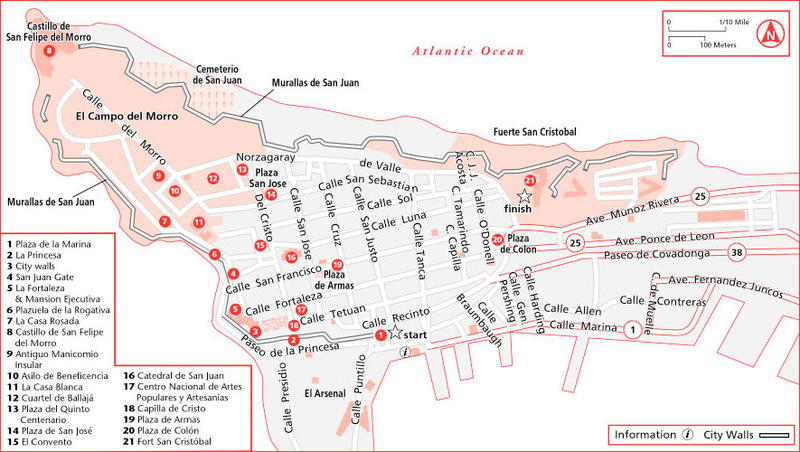 In the 20th century the city expanded beyond its walled confines, known as Old San Juan, to incorporate suburban Miramar, Santurce, Condado, Hato Rey and Río Piedras. San Juan is the largest processing center of the island, the metropolitan area has facilities for petroleum and sugar refining, brewing and distilling and produces cement, pharmaceuticals, metal products clothing, and tobacco. The port is one of the busiest in the Caribbean. San Juan is the country's financial capital, and many U.S. banks and corporations maintain offices or distributing centers there. San Juan is center of Caribbean shipping and is the 2nd largest sea port in the area (after New York City). This is a 500-year-old neighborhood originally conceived as a military stronghold. Its 7-square-block area has evolved into a charming residential and commercial district. The streets here are paved with cobbles of adoquine, a blue stone cast from furnace slag; they were brought over a ballast on Spanish ships and time and moisture have lent them their characteristic color. The city includes more than 400 carefully restored 16th- and 17th-century Spanish colonial buildings. Old San Juan is a main spot for local and internal tourism and attracts many tourists, who also enjoy the gambling casinos, fine beaches, and tropical climate. More tourists visit San Juan each year than any other spot in the Caribbean. A leisurely foot tour is advisable for those who really want to experience this bit of the Old World, especially given the narrow, steep streets and frequently heavy traffic. To really do justice to these wonderful old sites, you'll need two mornings or a full day. Old San Juan provides a free trolley service to get you around the city. The trolley runs every day Monday through Friday from 7am until 6pm, and Saturday and Sunday from 9am until 7pm every 15 minutes. Most of the trolleys are accessible for wheelchairs and mobility devices and identified with the blue International Symbol of Accessibility. You can also explore Old San Juan at your own pace on a bike, rent your own bicycle for $27 a day, helmet included. Rent the Bicycle, 1-787-602-9696. Old San Juan has several plazas: Plaza de San José is a favorite meeting place for young and old alike. At its center stands the bronze statue of Ponce de León, made from a British cannons captured in during Sir Ralph Abercromby's attack 1797. The plaza is skirted by a number of historic buildings. Abutting Plaza San José is the Plaza del Quinto Centenario (Quincentennial Square), opened in October 12, 1992. This plaza is the cornerstone of Puerto Rico's commemoration of the 500th anniversary of Columbus' discovery of the New World, has a sculpture which rises 12 meters (40 feet). The monumental totemic sculpture in black granite and ceramics symbolizes the earthen and clay roots of American history and is the work of Jaime Suarez, one of Puerto Rico's foremost artists. Plaza de Armas (Arms Square) is Old San Juan's main square, on San José Street. Features four statues representing the four seasons; all are over 100 years old. It was carefully planned as the main city square and has served as a social meeting place for generations. Plaza de Colón (Columbus Square) was originally called St. James Square was renamed in 1893 to honor Christopher Columbus on the 400th anniversary of his discovery of Puerto Rico; bronze tablets at the pedestal of the Columbus statue record important episodes in the explorer's life. Plazuela de la Rogativa (Plaza of Religious Procession) was built in 1971, features a modern sculpture depicting a procession of religious women commemorates an event that took place on the site in 1797. During the spring of that year, a fleet of British ships led by under Sir Ralph Ambercrombie sailed into San Juan Bay, meaning to launch an assault on the city and take control of the colony. When the attack was foiled, they undertook a naval blockade of San Juan, hoping to starve the residents into submission. As the towns people began to despair of any help from soldiers garrisoned in the inland towns, the governor ordered a rogativa, or divine entreaty, to ask the saints for assistance. The women of the town formed a procession through the streets, carrying torches and ringing bells. The British, hearing the commotion and seeing the moving lights, decided that reinforcements had arrived and quickly sailed off. The Plaza de Hostos is located near La Casita, features artisan displays, snack stands, and traditional piragüeros, who sell shaved ice topped with tropical fruit syrup. La Perla is a historical ramshackle barrio astride the northern historic city wall of Old San Juan, Puerto Rico, stretching about 650 yards (600 m) along the rocky Atlantic coast immediately east of the Santa Maria Magdalena de Pazzis Cemetery and down the slope from (north of) Calle Norzagaray. It is not probably a sight you expect to see in a major tourist zone. Established in the late 19th century, the zone was designated for cemeteries, slaughterhouses, and homes of former slaves, servants and the homeless. 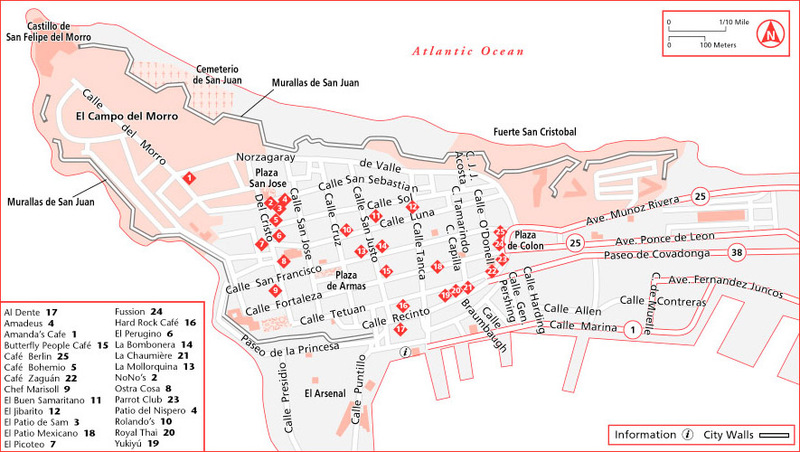 The law required to be established away from the main city zone; in Old San Juan's case, outside the city walls. Over time, the city's poorer residents established their homes there. Today, La Perla has a population of 338, 198 housing units (29 unoccupied). Residents have defended their right to keep their homes despite goverment efforts to get them to move and transform the area to increase tourism revenue. 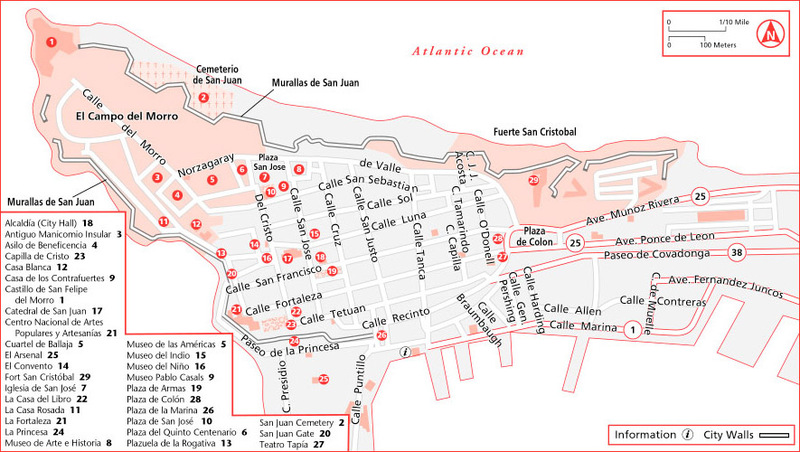 If you have only one day to explore Old San Juan, these are my recommendations. The Parque de las Palomas (Pigeon Park) is located near the Paseo de la Princesa, next to Capilla del Cristo at the end of Cristo Street. This park overlooks the restored La Princesa Jail, now a government office with an attractive art gallery. It is the perfect spot from which to enjoy a magnificent view of the harbor, city and mountains. It is also a great choice for families with small children; kids will enjoy interacting with the local pigeons. The Luis Muñoz Rivera Park is an spacious ocean side park with large trees, landscape gardens and wide walks, located on Jesús T. Piñero Avenue. Open Tues-Sun 9:00am - 5:00pm. Other parks include: Martí Coll Linera Park, and Central Park (with facilities for jogging, baseball, calisthenics and tennis). San Felipe del Morro was named in honor of King Phillip II, commonly known as El Morro, is a 16th-century citadel. The word itself sounds powerful and this six-level fortress certainly is. The construction of the Castillo San Felipe del Morro began in 1540 when King Charles V of Spain authorized its construction, including the surrounding walls and completed in 1589. Most of the walls in the fort today were added later, in a period of tremendous construction from the 1760's-1780's. Rising 140 feet above the sea, its 18-foot-thick wall proved a formidable defense. It fell only once, in 1598, to a land assault by the Earl of Cumberland's forces. The fort is a maze of tunnels, dungeons, barracks, outposts and ramps. El Morro is studded with small, circular sentry boxes called garitas that have become a national symbol. The views of San Juan Bay from El Morro are spectacular. The area was designated a National Historic Site in February, 1949 with 74 total acres. It has the distinction of being the largest fortification in the Caribbean. In 1992, in honor of the 500th anniversary of the discovery of Puerto Rico by Christopher Columbus, the fortress was restored to its historical architectural grace and beauty. El Morro Fortress is a National Historic Site administered by the National Park Service. The fort is open to the public everyday from 9am to 6pm except on Thanksgiving Day, Christmas Day and New Year's Day. Admissions US$5 adults, children under 15 free, 1-787-729-6960. Castillo de San Cristóbal (San Cristóbal Fort) is El Morro's partner in the city's defense. Built in 1634 (completed in 1771), was considered the Gibraltar of the West Indies. San Cristóbal was supported by a massive system of outworks which provided defense in depth and is is one of the largest defenses ever built in the Americas. It rose 150 feet, covering 27 acres of land. As if its size and height weren't sufficient to intimidate enemies, its intricate modular design was sure to foil them. A strategic masterpiece, it features five independent units, each connected by moat and tunnel; each fully self-sufficient should the others fall. It's a World Heritage and National Historic Site, administered by the U.S. National Park Service. Open daily from 9am to 6pm; 1-787-729-6960. The Fuerte San Gerónimo (San Gerónimo Fort) was built on the opposite end of San Juan to strengthen the city's defenses. The fort is located behind the Caribe Hilton Hotel, with small military museum in Puerta de Tierra. La Fortaleza (also known as the Palacio de Santa Catalina began construction in 1533 and finalized the 25 of May of 1540, as a fortress. It was authorized to be built by Charles V as a defense against Carib Indian attacks. The building was the first of a series of military facilities constructed in the Bay of San Juan, but soon later proved inadequate to guard the entrance to the harbor, and became the official Governor's Residence. The oldest governor's mansion still used as such in Western Hemisphere and part of the old city's World Heritage Site. It has been occupied twice by invaders; by the Earl of Cumberland in 1598 and by the Dutch General Bowdoin Hendrick in 1625 when the building was damaged by fire. A major reconstruction was undertaken in 1640. In 1846, the building was remodeled and given a palatial aspect, uniting harmoniously 16th century military architecture with the refinements of the 19th century. It has been the home of 170 governors of Puerto Rico and is the official residence of the current governor. Although the original structure (Palatial Building surrounded by gardens) was very primitive, La Fortaleza has undergone numerous changes over its 300 years of history. Free tours are available daily. Open Mon-Fri 9:00am-4:00pm; guided tours in English on the hour, in Spanish every 30 minutes, 1-787-721-7000 ext. 2358. Tours last about 40 minutes. Access to the official areas is not permitted. The Alcaldia (San Juan's City Hall), started construction in 1602, completed in 1789. In the 1840's the building was heavily remodeled providing its present day facade intended by its builders to be an exact replica of Madrid's. The building has a tourism information center and a small gallery for periodic exhibitions. Open Mon-Fri 8am - 4pm, except holidays. Free admissions. 1-787-724-7171 ext. 2391. El Capitolio (Capitol Building of Puerto Rico) hold the offices of senators on one wing and those of representatives on the other, with galleries, friezes, mosaics and an impressive rotunda in which Puerto Rico's constitution is exhibited. Construction began in 1919 and the building was inaugurated on February 11, 1929. Guided tours by appointment only, Mon-Fri 9am-5pm, 1-787-721-5200 ext. 301. The Catedral de San Juan (San Juan Cathedral) is the second oldest cathedral in the Western Hemisphere; construction began in 1521. The original church on these grounds had wooden walls and a thatched roof. It was destroyed by hurricane in 1526 (October 4th), rebuilt in in 1540, looted in 1598, and damaged by another hurricane in 1615. The Cathedral as seen today is the result of work done in 1917, when major restorations were performed. This Cathedral is an authentic and rare New World example of medieval architecture. The cathedral contains the marble tomb of the island's first governor Juan Ponce de León and the relic of San Pio, a Roman martyr. San Juan Cathedral still holds religious services on a regular schedule. Visitors can explore the cathedral from 8:30am to 4pm daily. The Iglesia de San José (San José Church) began construction in 1523. Juan Ponce de León gave the land where the Church now stands. Originally called the Church and Monastery of Saint Thomas Aquinas, it was built by Dominican friars to serve as the monastery's church and chapel dedicated to Saint Thomas Aquinas. The section erected in 1532, the Main Chapel or Sanctuary, is an excellent example of 16th century Spanish Gothic architecture. Ponce de León, was buried here for 300 years until his body was moved to the San Juan Cathedral in 1913. This was the family church of Ponce de León's descendants. Puerto Rican painter José Campeche, who contributed a great deal to the beautiful churches of his island, is buried here. Open Mon-Sat 8:30am - 4pm, Sun mass at 12:00pm; 1-787-725-7501. The Capilla del Cristo (Cristo Chapel) was built in the 18th century (1753). The stories surrounding the history of this small chapel conflict wildly except on one point: someone on horseback took a terrible spill off the cliffs at the end of Calle Cristo. Whether he lived, and the chapel was built to commemorate the miracle, or whether he died, and the chapel was to block off the street and prevent such an accident from happening again, is the part of the story that is in dispute. The beautiful Campeche paintings and altar inside can be seen through the church's glass doors. Open Tues. 10am - 4pm. The Casino of Puerto Rico was built just before World War I. The exterior - in the style of French mansions of the Louis XVI era, a copper copula, a large ballroom with elaborate plaster-work and a 12-foot chandelier distinguish this building. The Teatro Tapia (Tapia Theater) was built in 1832 (financed by subscriptions and by taxes on bread and imported liquor) and remodeled in 1949 and 1987 is one of the oldest theaters in the Western Hemisphere, was named for Alejandro Tapia y Rivera, the famous Puerto Rican playwright. Still hosts a variety of entertainment in the fine arts, plays, ballets and concerts. 1-787-721-0169 or 1-787-721-0180. Centro de Bellas Artes (Fine Arts Center) opened its doors in 1981. The modern facilities offer concerts, plays, and opera. It is the largest fine arts center in the Caribbean. Located on Ponce de León Avenue, Santurce. Ticket windows are open daily from 10am to 6pm. and remain open until 8:00 p.m. on performance nights. 1-787-725-7353, 1-787-725-7354 or 1-787-725-7358. The Escuela de Artes Plásticas (School of Fine Arts) was built by the Spanish colonial government in the 1800s. Previously the facilities served as an asylum for mental patients. La Intendencia, formerly the Spanish colonial exchequer, a fine example of 19th century Puerto Rican architecture, now houses Puerto Rico's State Department. Open Mon-Fri 8am - 12pm, 1pm - 4:30pm, 1-787-722-2121. The San Juan Museum of Art and History was built in 1855 as a market and restored in 1979 as a cultural center, showcases Puerto Rico art and music, including concerts and festivals. Open Tuesday-Sunday, 10am - 4pm, 1-787-724-1875. The Pablo Casals Museum is the Spanish master's legacy to the people of Puerto Rico. The museum collection includes manuscripts, memorabilia, photographs and a library of videotapes of Festival Casals concerts. Casals moved to Puerto Rico with his wife in the 1950s. He became the conductor of the Puerto Rico Symphony Orchestra and the president of the Conservatory of Music in Puerto Rico. The museum is open Tuesdays through Saturdays, 9:30am to 5:30pm. Admissions US$1 adults, US$0.50 children, 1-787-723-9185. Casa de los Dos Zaguanes (House of the Two Foyers) is home of the Museo del Indio (Museum of the Indian) and features exhibits on the indigenous peoples of the Caribbean region, with exhibits, ceramics and archaeological digs. Located on San José Street, Old San Juan. Open Tues-Sat 9am - 4pm. Admission free, 1-787-724-5477 or 1-787-722-1709. The Asilo de Beneficencia (Home for the Poor) was built 1840s for the indigent people. Today houses the Instituto de Cultura Puertorriqueña (Institute of Puerto Rican Culture) offering exhibits galleries every day, features an impressive collection of artifacts from pre-European Puerto Rico, including pottery, stone tools and relics, and a recreation of a Taíno village. Open Wed-Sun: 9am - 4:30pm. Admission: US $1. 9 Calle Santana Elena Norzagarais, 1-787-724-5949 or 1-787-724-5477. The Convento de los Dominicos (Dominican Convent) was built by Dominican friars in 1523, this building has served alternately as a convent, as a shelter against Carib Indian raids, and as the Caribbean headquarters of the U.S. Army. The convent contains a small chapel museum. Open Wed-Sun, 9am - 12pm, 1pm - 4:30pm; cultural events are sometimes held in the patio, art exhibitions in the galleries, 1-787-721-6866. The Casa Blanca (White House) was built in 1521 and lived in by Ponce de León descendants for over 250 years. In 1779 it was taken over by the Spanish military, then used later by the United States as a residence for military commanders (1898-1966). Today the mansion serves as National Historic Monument, housing a museum of 16th, 17th and 18th century history. Each room is decorated in a style associated with a period of the house's history. Casa Blanca is the oldest continuously occupied residence in the Western Hemisphere. Located on San Sebastián Street, Old San Juan, it houses a ethnographic museum and Taino (native Indian) artifacts. Open to the public Tuesday through Sunday, 9am to noon, 1pm to 4:30pm. Guided tours Tuesday-Friday by appointment. Admission US$2 adults, US$1 children, 1-787-724-4102. The Casa Rosada (Pink House) was built in 1812 for the Spanish army. Today houses a government tourism office where you can pick up brochures, maps and a complimentary welcome cocktail made with Puerto Rican rum. La Casita (Little House) is home of the Puerto Rico Tourism Co. Information Center. Open Mon-Wed from 8:30am to 8pm; Thu-Fri until 5:30pm; and Sat-Sun, 9am to 8pm. 1-787-722-1709. The Casa de Ramón Power y Girault is the headquarters for the Conservation Trust of Puerto Rico, it also serves as a conservation resource center, in which critical environmental issues can be explored through an interactive multimedia exhibition entitled OJO-ISLA. Located at 155 Tetuán Street. Open Tuesday through Saturday, from 10am to 4:00pm, 1-787-722-5834. The Ruinas de Caparra (Caparra Ruins) are those of an ancient fort where Ponce de León founded the first settlement on the island in 1508. The Museum of the Conquest and Colonization of Puerto Rico at the ruins offers historical documents, exhibits and artifacts. Open daily 9am - 4pm, 1-787-781-4795. The Cuartel de Ballajá (Ballajá Barracks or Ballajá Quarters) housed Spanish soldiers and their families in the late 1800s, the building could accommodate up to 1,000 people. The construction began in 1854, the main building was completed in 1863 and the chapel was added in 1881. Originally conceived as a solution to the lodging needs of military personnel stationed in San Juan. The Cuartel de Ballajá is a three-story square building with large gates on two ends, ample balconies, designed with a series of arches and a protected central courtyard that served as a plaza and covers a reservoir. The Cuartel de Ballajá was the last and largest building constructed by the Spaniards in the New World. Facilities included officer quarters, warehouses, kitchens, dining rooms, prison cells and stables. After the Spanish American War, the U.S. Army used Ballajá to house its Infantry division. In 1943, it was converted into a military medical facility, known as the Rodriguez Hospital and it was part of the Fort Brooke structure. Today it houses the Museum of the Americas (inaugurated October 12, 1992), located on its second floor. The museum features changing exhibitions, craft exhibits and an impressive collection of Caribbean and European American art and artifacts, most notably a diverse collection of carved santos (saints). Open Monday-Friday 10am - 4pm, Sat-Sun 11am - 5pm, guided tours available weekdays 10:30am, 11:30am, 12:30pm and 2pm. Admission free, 1-787-724-5052. The Museo de Doña Fela (Felisa Rincón de Gautier Museum) is a colonial building that was once the home of Felisa Rincón de Gautier, the dynamic mayor of San Juan from 1946 to 1968. Memorabilia from the mayor's life, such as plaques, correspondence and furniture, are on display. Open Mon-Fri: 9am - 4pm; 1-787-723-1897. The Sacred Heart University with the Museum of Contemporary Puerto Rican Art (Tue-Sat 9:00-4:00 p.m., Sun 11am - 5pm, 1-787-268-0049. Others museums include: The Archaeologist Adolfo de Hostos Museum, and the Museum of the Seas. San Juan Beach & Resort area. 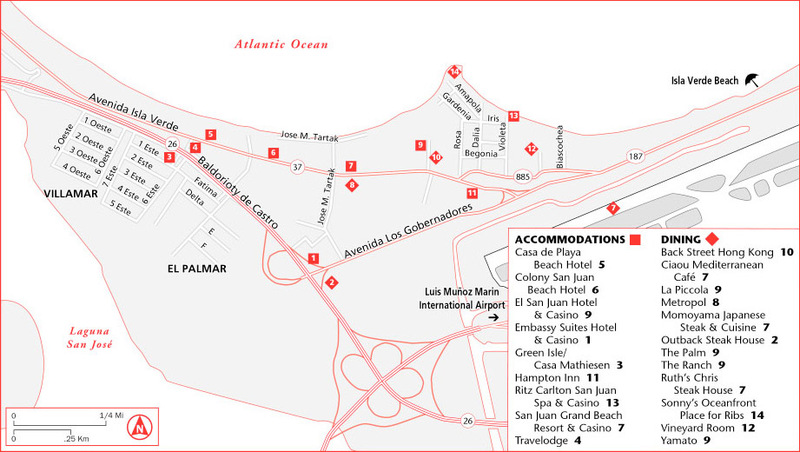 This area starts just outside of Old San Juan and includes the areas of Condado, Miramar, Ocean Park and Isla Verde. This is a area of fancy hotels, casinos, nightclubs, restaurants and chic boutiques. Casa de los Contrafuertes (House of Buttresses) is a traditional Spanish-style home, which holds the Museum of Colonial Architecture and the Museum of the Puerto Rican Family. This is believed to be the oldest residence left in Old San Juan, dating back to the early 18th century. Open Wed-Sun, 9am - 4:30pm, 1-787-724-5949. Also within Casa de los Contrafuertes you will find the Museo de Nuestra Raíz Africana (African Heritage Museum), features African artifacts, including masks, maps, musical instruments, and paintings. Open Mon-Fri from 9:30am to 5pm, and Sat from 10am to 5pm. Admission free, 1-787-724-4294 or 1-787-724-4184. Casa del Libro (House of the Book) is an 18th-century house that is now a book museum holding a rare collection of early manuscripts and books (nearly 5,000 works), some dating back to the 15th century. Among the museum's most precious possessions are two royal mandates signed by Ferdinand and Isabella in 1493 concerning provisioning Columbus' fleet for his second voyage. Open Tues-Sat, except holidays, 11am - 4:30pm, 1-787-723-0354. La Princesa (the princess), formerly the local San Juan penitentiary was built in 1837. It is elegantly landscaped with trees, a fountain, and a bronze sculpture. The building houses the Puerto Rico Tourism Company headquarters and rotating art exhibits. Open Mon-Fri from 9am to 4pm. 1787-721-2400. Paseo de la Princesa (promenade of the princess) is an elegantly landscaped walkway with trees, statues, benches, street lamps and kiosks. The promenade faces the bay. Centro Nacional de Artes Populares y Artesanias (Popular Arts and Crafts Center) is part of the Puerto Rico Institute of Culture, displays and offers for sale a verity of island crafts. University of Puerto Rico which include campus, University Museum and the Jardin Botánico (Botanical Garden) is located in the Río Piedras. The University Museum has archaeological and historical exhibitions, and also monthly art exhibitions. Open Monday-Friday, 9am - 11pm, weekends 9am - 3pm, 1-787-764-0000, ext 2452. The Botanical Garden is a living laboratory of the native flora of Puerto Rico, with over 200 species of tropical and sub-tropical plants. There are many exotic plants, including Egyptian papyrus, red palm, rain tree, candle tree, cantaloupe tree, the shapely Puerto Rican palm, and much more. Open daily 9am - 4:30pm, 1-787-250-0000 ext 6580 or 1-787-763-4408. The YMCA was built in 1914 and today shares the building with the Olympic Committee. Its facilities include a patio and the Salón de los Presidentes, (a meeting room). Cementerio de San Juan (San Juan Cemetery) is located between El Morro and the rocky cliffs above the Atlantic is considered one of the most picturesque of burial grounds anywhere. The cemetery is particularly noteworthy for its elaborate tombstones and the circular neoclassical chapel dedicated to Mary Magdalen. The most notable piece is a circular, red-domed chapel, which dates back to the late 19th century. Piñones Reserve is a sub-tropical moist forest, includes mangroves, sea turtle nesting sites and beautiful beaches. No camping allowed. Colonial Adventures offers organized historical and art walking tours of Old San Juan, 1-787-729-0114. Ferry services are offered from San Juan to Cataño, across the San Juan Bay. Departs daily from Pier 2 in Old San Juan every half-hour between 6am and 10pm. For information call 1-787-788-1155. The manufacturing in San Juan includes clothing, sugar refining, cement, metal goods, tobacco and brewing. The San Juan flag was officially adopted on March 8, 1948. It displays coat of arms of the city in the center on a white field. San Juan enjoys year round summer temperatures, an average annual temperature of 79.9°F (26.6°C). On average, the warmest month is June and the coolest month is February. San Juan averages 50.75 inches (1,289 mm) of rain per year. November is the average wettest month. Three Kings Day is the traditional gift-giving holiday on the island, commemorates the day that the three Wise Men brought gifts to the Christ child. In La Fortaleza the governor honors the tradition by handing out gifts to island children. Every Tuesday at 6:00pm San Juan National Historic Site and Puerto Rico Tourism Company present Ballet Folklórico Areyto as part of the Le Lo Lai Cultural Festival. Fort San Cristóbal is located on Norzagaray St. Entrance fee is $3.00 for adults, $2.00 for seniors, $1.00 for children 13 and above. Children under 12 are free. This festival sponsored by the Institute for Puerto Rican Culture, take place in San Sebastian street for three days, celebrating Puerto Rican culture with a full program of parades, folkloric dances, music, food and crafts. A world-class music festival honoring the cellist and composer Pablo Casals take place in San Juan, Ponce and Mayagüez every year. Fine Arts Center. Avenida De Diego at Avenida Ponce de León. Every year, San Juan celebrates a patron saint festival. The festivities include dances, food, parades and religious processions. San Juan celebrates the island's patron saint with week-long festivities, including religious processions, music, dancing, games and beach bonfire parties. At midnight on the first day of festivities, revelers walk backward into the ocean or nearest body of water three or seven times to ward off evil spirits and renew good luck for the coming year. Puerto Rico's very own film festival shows entries submitted by countries from all over the world. Live music and dance shows take place at Darsenas Plaza next to to La Casita Tourism Information Center and on Sunday 4 to 7 children's theater followed by romantic sunsets, trio concerts are held along Paseo La Princesa, open to the public. A program of musical shows sponsored by the Puerto Rico Tourism Company. Cards may be purchased for $10 at authorized local travel agencies and participating hotels (Condado Beach, Caribe Hilton and the Sands). Participating tour operators offer tour discounts with your LeLoLai card. When the United Nations designated world-class historic sites such as the Taj Mahal, it named six monuments in Old San Juan. San Juan is the largest home-based cruise port in the world. Twenty-eight vessels use San Juan as their home port, and each year new cruise ships either originate or call at the port.